In Australia we are rich with wildlife of all types and usually these animals don’t conflict with our suburban lifestyle. However occasionally we do get unwanted ‘visitors’ and one of these is the possum. The first thing that we all need to be aware of is that possums are a protected species under the Wildlife Act of 1975 and as such they cannot be harmed or retained in any way without an authority from the Department Of Conservation And Environment. Perth Pest Control is a licensed possum removalist and we have set procedures in place that we follow in the humane entrapment and release of possums in Western Australia. Possums do present a few issues for householders in WA notable amongst these is damage that can be caused by possums to homes and gardens. If nesting in a roof void, possums will leave droppings and urine around the nest and as they are territorial creatures, the scent of these excretions tends to be quite unpleasant and in fact it’s not uncommon for urine to permeate ceilings and leave unwanted stains in plaster. Possums are similar to rodents in that they tend to gnaw on anything and this can include electrical wires and circuits. Unfortunately the damage, quite often, isn’t realised until it’s too late when short circuits and even fires may have resulted from a possum’s presence. 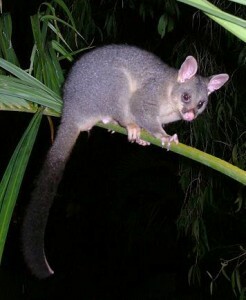 Possums are largely herbivores. They love fruit and some flowers and it’s not unusual to see flower beds and vegetable gardens that have been visited and perhaps eaten, and subsequently damaged by possums. Of course noise is a big problem with possums. When they nest in ceilings inevitably they make a lot of noise and in fact the loudness of their scurrying and playing can be an indicator of a possum’s presence versus that of a mouse or rat. Being nocturnal creatures, inevitably this noise tends to occur at times we are perhaps asleep so it becomes even more of a nuisance! As mentioned previously, possums cannot be harmed and the only method of possum control on your property is catching and releasing them. Perth Pest Control employs custom made possum traps that are specifically designed to humanely trap possums for later release. Because possums seem to have an ever increasing presence in the Perth metropolitan area, all our mobile technicians now carry possum traps on board their vehicles. We can supply a possum trap for typically 21 days and it’s important to note that during this time it’s essential to inspect the trap on a daily basis. This can be done by the homeowner or can be undertaken by one of our technicians. We will also advise you on ideas to physically “possum-proof” your home to assist with the prevention of any future possum visits. It’s very important to be aware that if you detect the presence of either possums or rodents in your home, to contact our office and not try a DIY approach with store bought baits. This situation has arisen before where a homeowner mistakenly thought they had rats but they were in fact possums and these possums subsequently ate the baits and died. It must always be remembered that harming possums in any way is an offence under our state and federal laws and possum control should only be undertaken by licensed professionals. Perth Pest Control are experienced in all aspects of possum control and please contact us for further details. The videos below show a couple of interesting things about Brushtail Possums and to see more videos like these, visit our YouTube channel HERE. Possums are our noisest marsupial! I hear noises in my ceiling . . . how can I tell if I have rats or possums? Possums can make a lot of noise! They can scratch and scurry around and even play in your ceiling and they’re nocturnal creatures so this noise tends to happen at night. A rat’s presence can also be heard by scratching and scurrying so it is hard sometimes to distinguish between the two. A clearer indication of a possum’s presence can be given by their droppings which tend to be larger than that of a rat. How do you eliminate possums from my house? We use a humane trap to catch the possum. It’s a steel mesh baited trap that will hold the possum without harm until it can then be removed from your house. Do you kill the caught possum? No! Possums are a protected species and as such cannot be harmed in any way. At Perth Pest Control we humanly trap them and then remove them to another location for release. Do I hire a possum trap from you and will you maintain it? Yes on both questions. Our possum removal service includes an initial setup and 21 days hire. We can provide a daily inspection service of the trap although some people prefer to do it themselves. Extended hire periods for possum traps are also available. I seem to have ongoing possum problems, how can I reduce this? Once a possum, or possums, have been removed from your premises, a proofing plan may need to be implemented. This involves sealing up all potential possum entry points and Perth Pest Control can advise you on this. 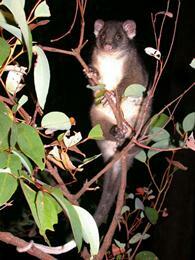 Also, keep low, overhanging trees away from your building as this is a popular entry point for possums.